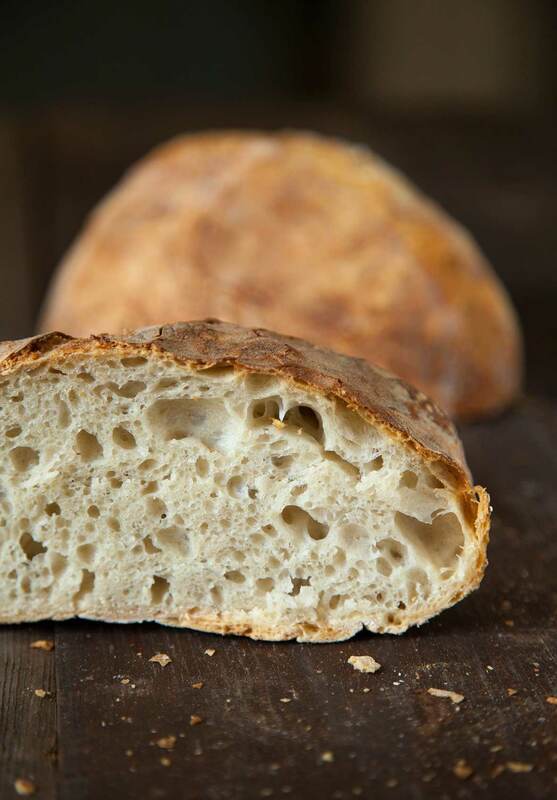 Jim Lahey’s no-knead bread recipe turned traditional bread making upside down for all of us. Made with just flour, yeast, salt, and water, the bread is the fastest, easiest, and best you may ever make. 2. Cover the bowl with a plate, towel, or plastic wrap and set it aside to rest at warm room temperature (but not in direct sunlight) for at least 12 hours and preferably about 18 hours. (Ideally, you want the room to be about 72°F. In the dead of winter, when the dough will tend to rise more slowly, as long as 24 hours may be necessary.) You’ll know the dough is properly fermented and ready because its surface will be dotted with bubbles. This long, slow fermentation is what yields the bread’s rich flavor. 3. Generously flour your work surface. Use a bowl scraper or rubber spatula to turn the dough onto the surface in one blob. The dough will cling to the bowl in long, thread-like strands and it will be quite loose and sticky. This is exactly what you want. Do not add more flour. Instead use lightly floured hands to gently and quickly lift the edges of the dough in toward the center, effectively folding the dough over onto itself. Nudge and tuck in the edges of the dough to make it round. That’s it. Don’t knead the dough. 4. Generously coat a cotton towel (not terry cloth) with flour, wheat bran, or cornmeal. Place the dough, seam side down, on the towel and dust the surface with a little more flour, bran, or cornmeal. Cover the dough with another cotton towel and let it rise for about 2 hours. When it’s ready, the dough will be double in size and will hold the impression of your fingertip when you poke it lightly, making an indentation. If the dough readily springs back when you poke it, let it rise for another 15 minutes. 5. A half hour before the dough is done with its second rise, preheat the oven to 450°F (232°C). Adjust the oven rack to the lower third position and place a 6- to 8-quart heavy pot and its lid (whether cast iron or enamel, Pyrex or ceramic) in the oven as it heats. 6. When the dough is done with its second rise, carefully remove the pot from the oven and uncover it. Also, uncover the dough. Lift up the dough and quickly but gently turn it over into the pot, seam side up, being very careful not to touch the pot. The blob of dough may look like a mess, but trust us, everything is O.K. Cover the pot with its lid and bake for 30 minutes. 7. Remove the lid and bake until the loaf is beautifully browned to a deep chestnut color, 15 to 30 minutes more. Use a heatproof spatula or pot holders to carefully lift the bread out of the pot and place it on a wire rack. Don’t slice or tear into it until it has cooled, which usually takes at least an hour. For me, this is the PERFECT bread recipe. Making bread is my obsession. I have made nearly every bread recipe you can name. 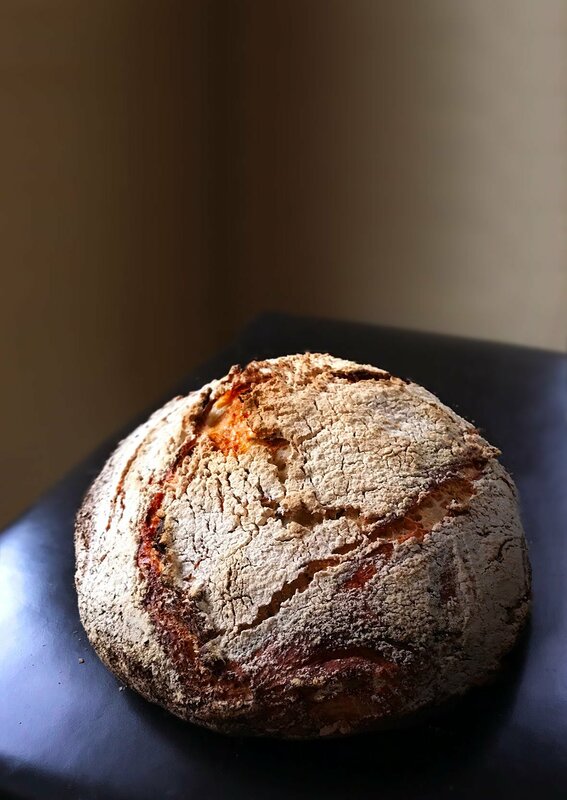 As much as I love the ritual of old-fashioned bread-making—kneading, resting, proofing, etc.—this no-knead bread recipe is my go-to loaf. I base this on two things: texture and flavor. This is hands-down the best-tasting "white bread" that I have ever eaten, let alone made. I use a digital scale and weigh my ingredients. Jim Lahey says this dough should be wet, trust him, it will be as wet as a ciabatta dough. VERY WET. When folding the dough, it doesn't have to be precise. I simply pull 4 edges up and toward the center. Then simply turn the dough, seam side down, on a floured cloth or linen. Do not scrimp on the flour for the tea towel. You will NEED a thick coating on the cloth or it will stick when you flip it into the 450°F Dutch oven. Trust me. Don't fret over how the dough looks when you put the lid on and just slide it back in the oven, set your timer for 30 minutes, and, like some crazy magic, when the lid comes off, it will always be perfect. The last 15 minutes is the hardest for me. I always want to take it out of the oven before it turns a lovely dark brown. DON'T DO IT! Let it bake without the lid for at least 12 minutes. Remove your masterpiece from the oven, carefully place it on a cooling rack (I use 2 silicone spatulas) and, while you're admiring your mastery, listen. The bread will crack and hiss and sing. Truly one of the most beautiful sounds that you'll ever hear. 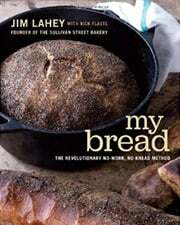 Jim Lahey's No-Knead Bread Recipe © 2009 text David Leite 2015. Photos © 2015 & 2018 David Leite. All rights reserved. All recipes and photos used with permission of the publisher.